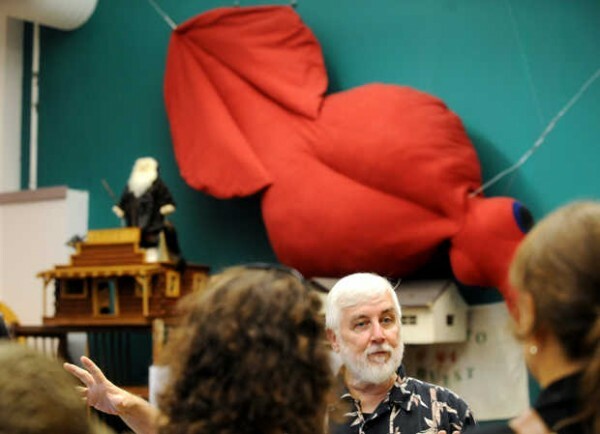 Loren Coleman explains the International Cryptozoology Museum in Portland to visitors from Buffalo, N.Y., under a colossal squid constructed by artist Sarah McCann. The squid's dimensions match a real animal found off New Zealand in 2007. A giant pterodactyl perches on the wall of the International Cryptozoology Museum in Portland. PORTLAND, Maine — Part-way down a rough, graffitied alley, through what was once almost certainly a side delivery door, you’ll find monsters and Loren Coleman. 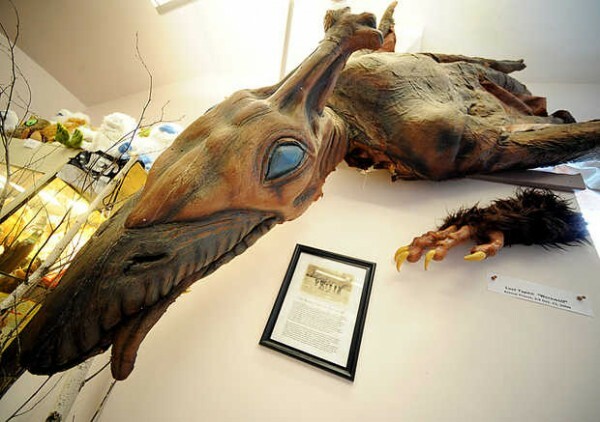 The space off Avon Street is home to the only cryptozoology museum in the world, two sizable rooms that Coleman has informally labeled fiction and nonfiction. Bigfoot is in the second. The 10,000 museum artifacts are mostly behind glass or slung from walls. These days, his collection is just a little lighter: Three hairs from a famous 1959 Yeti expedition in Nepal are at Oxford University in England undergoing DNA testing for an upcoming documentary. Coleman counts the hair among his prize pieces, and he’s prepared to have them debunked. When Coleman moved his International Cryptozoology Museum — a collection of footprint casts, full-scale models, toys, art, photos and taxidermy, mostly of animals not yet proven to exist, from his home to the downtown four years ago, he wasn’t sure what to expect for business. On a recent Friday, 76 visitors streamed through the door while Coleman staffed the museum alone. Assistant Director Jeff Meuse was out in the field for 10 days, first to Vermont for a lake monster Champ expedition and then to Rangeley Lakes to investigate more reported lake monsters and Bigfoot sightings. “It’s never a dull day around here,” Coleman quipped. The week’s entries in the guest book that stands by the door read from all over: Tucson, San Francisco, Raleigh, Las Vegas, Bristol, England. The museum is open Wednesday to Monday. Most weeks, when he’s not traveling, Coleman is there three days, including Saturdays. He’s a frequent guest on cable crypto shows such as “MonsterQuest” and an author whose latest book, “Monsters of Massachusetts,” came out Thursday. Coleman encourages visitors to sign the guest book and greets them with a quick introduction to the museum by the “Classic Animals of Discovery” cabinet — wildlife including a giant panda and okapi that people used to discount as legend. Displays are arranged by themes: Bigfoot, Loch Ness, the Dover Demon, chupacabras. A cabinet of artifacts and articles related to the Skunk Ape came together this spring when “Mysteries at the Museum” came to shoot footage for its next season. One of the new attractions: “Esau,” an imagining of a baby Bigfoot covered in soft, sparse hair and seated on pine boughs. Toys and artwork dominate the fiction room, including jackalopes, a fur-bearing trout, a monkey costume with a dangling eyeball labeled “Minnesota Ice Man” and a statue of Bandit the German shepherd. According to one of many signs, Bandit chased what was believed to be the Mothman into the woods in West Virginia in 1966 and was never seen again. “Some people are here for two hours; some people are here for 15 minutes,” Coleman said. Marjean Cosentino of Boston, visiting with husband Brian, took in the artifact labels and posed for a picture with the museum’s 8½-foot-tall, oxen-haired Bigfoot replica. In the middle of a five-year lease, Coleman said he’s interested in moving to a larger space with more room to expand. He’s hoping to secure federal nonprofit status for the museum this fall. He traveled to Idaho this spring to film an upcoming three-part documentary by the people behind “River Monsters,” talking about Bigfoot and Yeti. It’s the reason for the new DNA testing. The hairs come from what’s known as the Tom Slick-F. Kirk Johnson Snowman Expedition of 1959. The documentary, with DNA results, is expected to air in England in December and in the U.S. next year. Other work this year has taken him to Utah, Florida and Illinois. More trips are planned soon for Michigan, New York and Florida. Visitors to the museum have come from as far as Nepal, with one couple with family in the Philippines, Boston and New York hiring the museum out for a destination wedding reception. They may also have inspired him: Coleman is planning to hold his own invitation-only reception at the museum on Halloween when he marries fiance Jenny White. At least one guest has talked about pitching in to buy the happy couple a large bronze sculpture of a Tasmanian tiger (striped, vicious-looking and recently, likely, extinct) for the museum as a wedding gift. Wedding guests and visitors alike will discover that the thoroughness of the International Cryptozoology Museum even extends to the bathroom. There’s a Bigfoot quiz above the toilet paper. Spoiler alert: Coleman is No. 1.